Otomaco – Last Jade Journey is the first installment in the new Otomaco Point’n’Click adventure series from Pastel Games. “Three travelers from the Asauri Valley are searching for the legendary city of Otomaco. Each of them wants to find a different treasure. The Ork Gheri dreams about Otaxi, the magic shield. The monk, Zeng, is looking for the lost papyrus from the god Olitec’s temple. 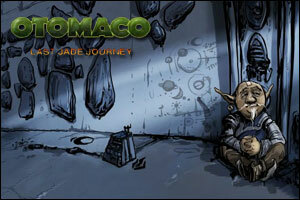 Otomaco – Last Jade Journey video walkthrough! What is the round thing with blue dots at the top for? Posted on Monday, April 26th, 2010. Follow any responses through the RSS 2.0 feed.